The tranquil mountain resort village of Pontresina is located in the Engadin in the Swiss canton of Graubünden. Famed for its typical three-storey barnhouses, the «Engadin Houses», the face of the village is shaped by large hotels. The local company Stricker Architekten designed a new build with five holiday homes that translate the traditional Alpine architectural idiom into the present – light and shadow interact beautifully on the façade. Close to the border with Italy and north of the Bernina Pass in Val Bernina you will come to the idyllic and tranquil mountain village of Pontresina with its 2,200-odd inhabitants. The famous «Rhätische Railway» lines that run through the Albula and Bernina countryside are the highest narrow-gauge railway tracks in Europe and among the steepest adhesion railways in the world. So it is not surprising that the railway lines, over a century old now, are included on the UNESCO World Cultural Heritage list. Given the mild and dry climate, the region is especially popular among nature-loving tourists and sporty types. Here, they can hike, climb mountains, go walking, biking, skating or play a round of golf. And on hot summer days, holidaymakers can refresh with a dip in one of the mountain lakes or simply go for a walk and enjoy the ever-present view of the summit of Piz Bernina – the highest mountain in the eastern Alps. On the edge of the large Saratz Park in the center of the village of Pontresina, Stricker Architekten designed the Chalet Alpine Lodge «Chesa al Parc» – with an unobstructed view of the surrounding mountains. On the site of a former 1970s private residence, the six-storey new build takes its cue from its outdated predecessor in terms of size, shape and alignment. The planners respectfully devised a modern variant of the traditional Alpine architectural style, with the lodge clad in refined looking wooden panels. While it has a closed feel to the street, thanks to closely arranged vertical lamellas made of larch, out over the slope the elements are spaced further apart. The partially concealed windows (hardly discernible during the day) are masterfully highlighted at night, by the illuminated rooms behind them. On the inside the highly varied façades ensure a lively mix of light and shadow on the four residential floors. The holiday apartments are between 70 and 150 square meters in size, offering plenty of space for 2-8 holidaymakers. Large floor-to-ceiling windows and an L-shaped balcony create lightsuffused bright rooms and contact with nature outside. Fair-faced concrete ceilings and walls clad in local pine harmonize with the dark oak parquet floors. The Formpark parquet elements are laid in a dotted pattern and shimmer in a myriad of ways depending on the light. This coherent material concept is applied in all the rooms, and together with the likewise bright, solid-wood furniture creates a comfy, warm atmosphere. A striking color contrast features in the bathrooms in all the apartments: turquoise mosaic tiles on the walls stand out from the large grey floor tiles. a spa zone on the podium storey offers extra relaxation and rejuvenation. 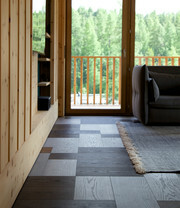 Direct access to outdoors in the form of a wooden deck, recliners, seats and showers mean guests can enjoy the impressive view of the Val Roseg and Piz Julier mountains. Pontresina’s boutiques, restaurants, children’s playgrounds and a themed swimming pool are only a few minutes’ walk away, rounding out the great range of holiday facilities. Although the idea is deceptively simple, it has never been done before. Formpark can be installed either in parallel or at a right angle thanks to its 1:3 and 1:2 proportions.